Idesco was delighted to learn its readers were just integrated into a rather modern deployment in Estonia. Integrator Nutihouse designs smart locking, lighting, security and energy system solutions for Estonian residential and business structures. They chose Idesco’s 8 CD 2.0 Pin readers to serve in a smart, two-factor authentication protocol they designed as part of a comprehensive solution for Tallinn’s storage space vendor, Kookon. Nutihouse’ team lead, Reijo Sirila, stated Idesco’s 8 CD 2.0 5 Pin reader was the most elegantly-designed outdoor RS-485 pin pad reader on the market that also complied with vital common standards. Kookon’s new smart storage system relies on Idesco’s readers to ensure customers can conveniently access their rented storage units even if they lack a smart phone. Traditionally, renters are encouraged to authenticate first by entering their phone number on the reader’s keypad. The system replies with an SMS containing a time-based one-time (TOTP) pin code to enter on the keypad which opens their unit. However, traditional RFID transponder access provides a vital backup to the mobile-mediated two-factor protocol Nutihouse developed. Together they secure Kookon’s system communication with Idesco’s readers and ensure reliable administration of its unit locks. 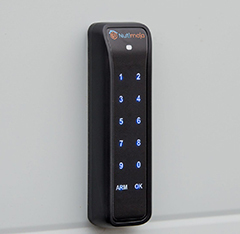 Nutihouse’s modern system solution also assures Kookon’s customers can access their use logs, credential and space management and even monitor via CCTV their storage space via mobile application. Finally, Kookon storage units rely on Nutihouse’s modern control software to save energy on heating and lighting. Display readers are poised to offer advantages extending well beyond mere visual feedback about a system’s state or a user’s transponder status.